The apartments are in a large residence that looks out over the village of Le Lavachet located at 2100m which is an ideal location for easy skiing. Access to the slopes is by chair lift directly from the village (about 50 metre walk) and you can ski straight back to the door of the residence!! There are numerous shops and restaurants in the village, and a 24 hour free bus service to the other villages in Tignes. We have wonderful views from the apartments. The north-facing ones have a view right across the valley of the Lac de Chevril dominated by the beautiful peak of the Grande Sassiere. 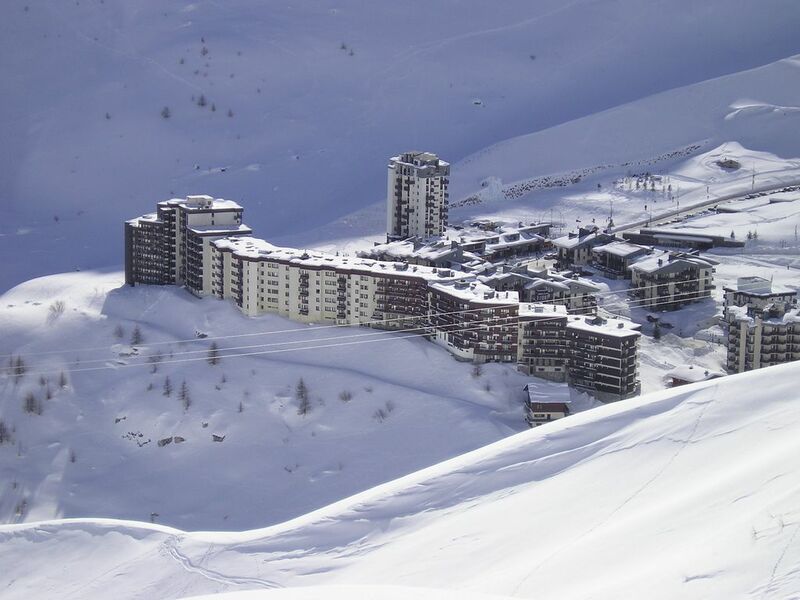 The large south facing apartments have a view of Tignes and the glacier on the Grande Motte. All apartments are modern and well furnished. They are all fully equipped to a high standard. The Skiing and Boarding: The apartment is situated in Tignes in the best mountain ski area in France, the Espace Killy, which links Val d'Isere and Tignes. The village of Le Lavachet offers a supermarket several bars and restaurants 2 lifts to whisk you up to the slopes and a regular bus service to link you with the other areas of Tignes.It is ideal for intermediates and advanced skiers, although beginners are well catered for, offering a learning area where they can be a part of the scene right in the centre of the village.The Grande Motte glacier offers skiing right through into early May. Take the opportunity to take a second ski trip late season when there is fantastic snow and the slopes are virtually empty. There is a first class boarder park in Tignes and also in Val d'Isere. The Golf: The golf in summer is on the Par 68 5000 yard course situated on the meadowed slopes of Tignes. Situated at 2100 metres it is the highest golf course in Europe. The experience of playing golf at this height is amazing as the balls fly for forever due to the thinner air. The wildlife of wild goats and marmots also provide a difference from the local golf course, but best of all are the natural hazards. TIGNESLOVE is a privately run business run by Clem & Pete Upton renting out our own ski apartments. We started with our first apartment 25 years ago in 1992 and added another apartment in 1999, 2001, 2003 & 2005 & 2007. We have many years experience of providing clients with a comfortable well equipped apartments so that you can enjoy your holiday without any worries about your accommodation. We have many regular clients who return year after year, proof that our apartments provide excellent accommodation. Le Lavachet is a village of Tignes 2100 right in the heart of the ski area. The apartments are in a large modern apartment building with good access to the pistes (50 metre walk to the path to ski down to the lifts) and then ski back to the front door. We chose Tignes because it has a superb snow record and the longest season in the French Alps starting from November and finishing in the middle of May. It has the Grande Motte glacier at 3250 metres which allows skiing at all times even if the snow cover is low in other resorts. Beautifully refurbished modern bathroom with shower and shower screen. Linen can be rented from us at £15 per person. Towels can be rented at £10 per person. We provide duvets and pillows. Private underground parking may be available at £65. Towels are included in the linen rental. Wifi available in large apartments free to our clients. Brand new refurbished kitchen with oven and ceramic hob, fridge freezer and dishwasher. Toaster and microwave also available. Espace Killy Ski area on your doorstep. The kitchen was well equipped with everything we needed. ...so nice to have good knives, scissors, tongs and decent sized mugs! The bed was very comfortable. Having 2 sofas in the living room was great for chilling in the evening. We probably took too much food with us as there was a very good supermarket and boulangerie within 50m so next time would just buy what we needed through the week. In fact everything you might need is within a very short walk..food, bars, ski pass, ski hire and the ski slopes. You really can ski back to the accommodation door. The only problem we had with the apartment was the shower which was powerful but at times unpredictable in it's temperature. Thanks for your kind review.... it’s always good to hear from our guests. Glad to hear there will be a next time! Sorry about the shower..... the hot water is communal throughout the building and is being replaced this summer as it cannot cope at nearly 50 years old!! Hopefully that will provide better continuity of hot water. Fab little apartment with great access to skiing. Lovely little flat equipped with everything you need for your skiing holiday. Nicely furnished and finished, great communication from owners answering any questions we had. Fab skiing in the area, easily accessible from the flat. Modern well furnished appartement, good location. The location of the appartement is very good only 50meters walking to start skiing, we were able to ski back to the appartement . Ski area is great. Thanks for the comments... I think you mean the sofa bed is small, it is 140 x 190 which is a standard double size in France. 190cms is the standard length for a bed in France. We made the double bed in the bedroom 200 cms to help taller people. The apartment is very well situated as a ski in and ski out location. Fantastic, fully refurbished large apartment. Clem was very helpful when I booked our stay in Tignes and it was lovely to be greeted by her and Pete when we arrived. The apartment was amazing with everything that we needed. A brand new bathroom and kitchen with a dishwasher, large fridge, small oven and hob. As a family of four it was large enough and there was a good sized double bedroom. There is free wi-fi which is very fast, we were pleased to have Netflix as there was no English TV. The area of La Lachevet is close to the slopes, you can ski back to the door and the ski bus takes you free of charge to the main ski area in Tignes, or you can walk 50 metres and ski down to the lifts, which is what we did after a lunch break. The buses come every 10 minutes all day and until late at night, it is a very short walk from the apartment to the bus stop. Next door there is a bakery and fully stocked supermarket. The local bar is English and had a long happy hour for cheap apres ski. We have stayed in Tignes in the summer before and it has an amazing range of activities from downhill mountain biking, lake fun and miles of paths to walk. We would recommend the accommodation and the area to anyone. Great apartment - big enough for our family of four. Clem provided lots of useful information. Local facilities were good and the suggested ski hire shop excellent: quality gear and friendly staff. Tignes is fantastic. The buses are easy into the centre or it is possible to ski down to the lavachet lifts. This is a very nice, well appointed, clean apartment in a lovely village, and Clem is really helpful. It is ideally located- you can ski back to the front door and the bus stops right outside to take you to Tignes Le Lac or Val Clarat (It's not far anyhow and we walked most of the time). The skiing is fantastic with loads of places to go on the Espace Killy pass. Lavachet is great too with a good grocers where you can get everything, top bakers, and loads of bars, all with really friendly people and about 100 yards from the front door. We had a great time and will be back. Situated at 2100 metres in the main area of Tignes, our village of Le Lavachet is by far the best! It has its own shops and restaurants and is easy to ski back to. There are 2 x 6 seater chairs to whisk you up to the slopes which you can ski down to and they never have any queues! Our village is the quieter area of Tignes and well suited for families. Golf: The golf in summer is on the Par 68 5000 yard course situated on the meadowed slopes of Tignes. Situated at 2100 metres it is the highest golf course in Europe. The experience of playing golf at this height is amazing as the balls fly for forever due to the thinner air. The wildlife of wild goats and marmots also provide a difference from the local golf course, but best of all are the natural hazards. Private under-cover parking in the adjacent garage is available at a cost of £65 week. Covered parking is mandatory in Tignes and the garage is just outside the apartment building and £15 cheaper then Tignes car parks. A linen pack includes sheets, pillowcases bath and hand towel can be rented for £15.00 pp. Apartments need to be left cleaned in same condition as they were on arrival.